I probably have the worst sports betting instincts on the planet! I have consistently lost money every year for the last 10 years. 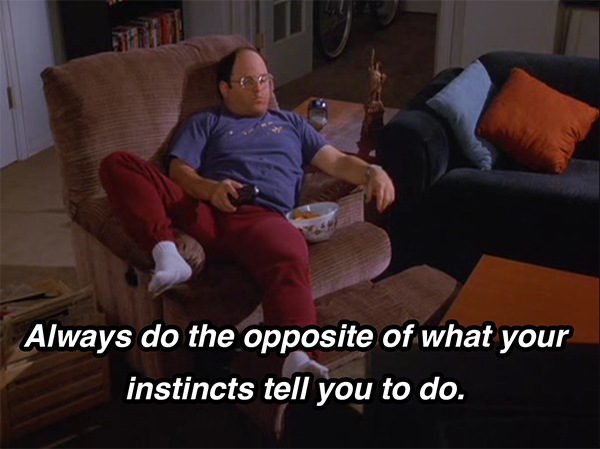 So following the footsteps of my idol George Costanza, I will do the opposite from now on! So I will take the opposite of every pick I think that will win. In theory, we will make a TON of money. I will explain what pick I would like to win and would normally pick in the pick write-up and then pick the opposite for the actual pick. Contact me at georgesoppositepicks@yahoo.com if you have any questions.